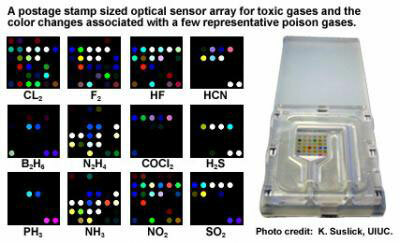 (Nanowerk News) Imagine a polka-dotted postage stamp-sized sensor that can sniff out some known poisonous gases and toxins and show the results simply by changing colors. Support for the development and application of this electronic nose comes from the National Institute of Environmental Health Sciences, part of the National Institutes of Health. The new technology is discussed in this month's issue of Nature Chemistry (An optoelectronic nose for the detection of toxic gases) and exemplifies the types of sensors that are being developed as part of the NIH Genes, Environment and Health Initiative (GEI). Once fully developed, the sensor could be useful in detecting high exposures to toxic industrial chemicals that pose serious health risks in the workplace or through accidental exposure. While physicists have radiation badges to protect them in the workplace, chemists and workers who handle chemicals do not have equivalent devices to monitor their exposure to potentially toxic chemicals. The investigators hope to be able to market the wearable sensor within a few years. "The project fits into the overall goal of a component of the GEI Exposure Biology Program that the NIEHS has the lead on, which is to develop technologies to monitor and better understand how environmental exposures affect disease risk," said NIEHS Director Linda Birnbaum, Ph.D. "This paper brings us one step closer to having a small wearable sensor that can detect multiple airborne toxins." The paper's senior author is Kenneth S. Suslick, Ph.D., the M.T. Schmidt Professor of Chemistry at the University of Illinois at Urbana-Champaign. Suslick and his colleagues have created what they refer to as an optoelectronic nose, an artificial nose for the detection of toxic industrial chemicals (TICs) that is simple, fast, inexpensive, and works by visualizing colors. "We have a disposable 36-dye sensor array that changes colors when exposed to different chemicals. The pattern of the color change is a unique molecular fingerprint for any toxic gas and also tells us its concentration," said Suslick. "By comparing that pattern to a library of color fingerprints, we can identify and quantify the TICs in a matter of seconds." The researchers say older methods relied on sensors whose response originates from weak and highly non-specific chemical interactions, whereas this new technology is more responsive to a diverse set of chemicals. The power of this sensor to identify so many volatile toxins stems from the increased range of interactions that are used to discriminate the response of the array. To test the application of their color sensor array, the researchers chose 19 representative examples of toxic industrial chemicals. Chemicals such as ammonia, chlorine, nitric acid and sulfur dioxide at concentrations known to be immediately dangerous to life or health were included. The arrays were exposed to the chemicals for two minutes. Most of the chemicals were identified from the array color change in a number of seconds and almost 90 percent of them were detected within two minutes. The laboratory studies used inexpensive flatbed scanners for imaging. The researchers have developed a fully functional prototype handheld device that uses inexpensive white LED illumination and an ordinary camera, which will make the whole process of scanning more sensitive, smaller, faster, and even less expensive. It will be similar to a card scanning device. "One of the nice things about this technology is that it uses components that are readily available and relatively inexpensive," said David Balshaw, Ph.D., a program administrator at the NIEHS. "Given the broad range of chemicals that can be detected and the high sensitivity of the array to those compounds, it appears that this device will be particularly useful in occupational settings."